Not going to lie, the only reason thrip exists is because I woke myself up laughing a few years ago with the idea of a giant insect that was trying to feed me. Wow, he looks like hell. Or even Boo from Monsters Inc. in her little monster outfit! @Localized: More like “plz eat this space peanut i plucked from your face” ;) – At least this looks like one of Mikes faceshrooms. It’s the ciiiiircle of Mike! On the bright side, considering how many human mouths a Thrip would have seen before, it’s doing pretty well not to have stuffed that up his nose. It looks like Kalla changed her hairstyle… a more relaxed coiffure for chillin’ at home with your sick alien? Does anyone else find this comic really, really boring now? And it’s ok guys, no need to like defend me… it’s up to the individual to decide what they want to spend their time on. Cord is free to read or not read; in the end there is no such thing as a story with 100% audience saturation. If this isn’t your bag then good luck finding a story more to your tastes elsewhere, or do like I did and write that story yourself. Nope, just you. Does anyone else find comments like yours really, really disrespectful? No. I was originally following The Meek and came here when Der Shing’s hiatus ended and started this up before resuming The Meek. I was interested, but wished that more attention were devoted to The Meek. I’m still very interested in The Meek, but over the past few weeks I’ve come to feel a bit more anticipation over the Mare Internum updates. I’ll echo the comments below that it’s rather disrespectful to leave a comment like this, particularly when the artist regularly reads and interacts with commentors. If you’re a top Patreon donor then I guess you can say what ever you want (although it’s still not very nice), but if you’re reading along for free, then don’t complain. Take a break from reading and come back when we’re a few more panels in. Thanks for reading both comics! And sorry about TM comic updates being a bit slow; I weight towards MI because I’m trying to get the entire comic wrapped up by the end of this year or early next year and need to keep up the pace, and also because TM pages tend to take me a bit longer to draw than MI pages do. You have nothing to apologize for – as I said, I look forward to updates on both comics, and at this point in time I’ll admit that I’m happy to see MI receiving updates more frequently. I think I still prefer the overall world setting of TM, but based on where we are in the storylines I’m more interested to keep advancing through MI. So MI will be finished up in less than a year? That’s kind of a sad thought… but definitely better than dragging things out in the way that so many other entertainment forms do. Nope, this is the second webcomic I check daily for updates, after the superlative Stand Still, Stay Silent. Also, the level of entitlement in comments like this is staggering. Thanks to the internet, I have around 5 freely accessible and fantastic ongoing stories to read, each of which is a passion project from an individual or small team. There’s many webcomics I haven’t liked, and their average quality was certainly below that of published comics, but to spout drivel like that makes you sound like a spoilt toddler. Either read and enjoy something, offer constructive criticism, or move on. I also love kallakore but because she is creepy and i have no idea what she is doing. Also love the “creepy” factor. You cant tell if Kallakore really IS creepy or if Der-Shing just messes with our heads and makes us falsely think that. Is… Thighfriend covering him like a blanket? How considerate! Thigfried is still alive and weaving. He Fought the Murderous Knife. Let’s all offer him a heart-felt sneeze! Mike’s gesture to thripfriend feels amusingly gentle considering the hellbrains he’s probably in right now, though I know it’s probably simply weariness as to the reason why he’s not chewing them both out right now. As a sidenote: gosh, the way you do patterns with lineart is so pretty. *a* aka the bed… thing he’s resting on. Where the heck is land sharks face? I cannot sort out its anatomy and body structure I’m tripping balls. He’s facing away from us. Never thought i’d call a insect/crustacean cute but thripfriend is the cutest little insect/crustacean ever. Yup, but two legs more and… KILL IT WITH FIRE !!!8!8!! Below those adorable google-eyes somewhere are mouth parts that may be the stuff of nightmares. Hard to dislike a crustacean who offers you nom-noms, though. LIKE…. 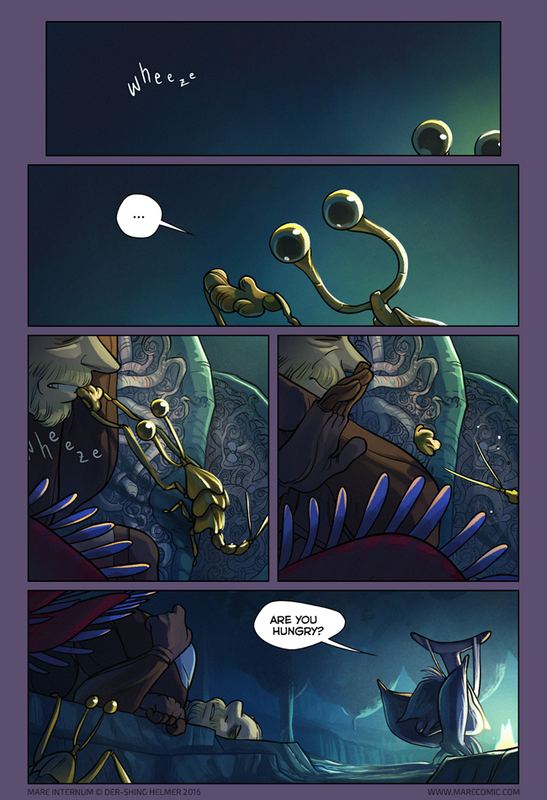 Dang, Insectoid Martian Crustacean… YOU CUTE. Thats not a glyph on the lip of the upper tier that Mike is on, is it? Or just a tentacle remnant? Thrip just became even cuter. Who knew. That wheezing can’t possibly be good. Looks like thighfish is back too. I… I want a Thripfriend to feed me, I want it so much ;_; And I don’t even like walnuts OR mushrooms so I doubt I’d like space walnut mushrooms but I would like them if a Thripfriend offered them. Not spoiling anything, but this is so cute, in hindsight.